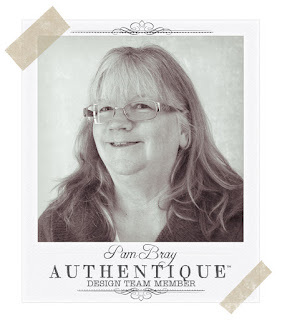 Happy October Authentique Fans; Pam here today!!! I have been in full swing creating Halloween projects. I couldn't help it but I had to create a project with a candy corn image!!! I mean after all... who doesn't love candy corn!!! SWEET right!!! Adhere pattern paper to 12" x 12" chipboard to create inside of frame. Cut and miter four 2" x 12" pieces of chipboard. Adhere pattern paper to top of mitered chipboard; adhere to top of chipboard to create frame. Die cut 5 3?4" doily; adhere to inside of frame. Cut four 2" square chipboard; adhere pattern paper to top of chipboard. Adhere to top of frame. Trace 4 3/4" x 6 1/2" candy corn to top of pattern paper. Cut traced candy corn image out with scissors. Cut pattern along inside lines; trace on pattern paper. Adhere to base candy corn. Punch 1/2" circles from pattern paper; add gemstones to top of circles. Stamp spider to pattern paper; fussy cut out and add to top of candy corn. 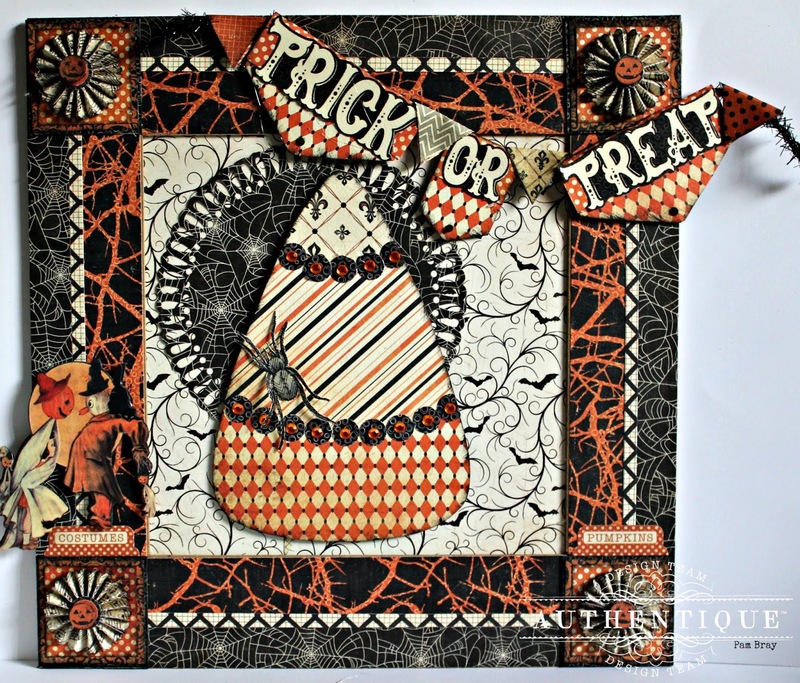 Fussy cut "Trick or Treat" from Epherema Card. Add to top of pattern paper flags. 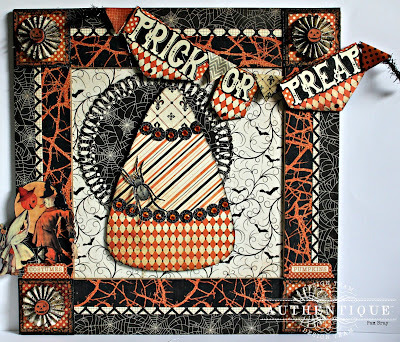 Add to top of frame with Halloween Tinsel Trim. Die cut 4 small rosettes; add to top of squares on each corner. Add small 1/2" pumpkin heads to center with pop dots. Add stickers to top of Fussy cut images from Epherema card; add to front of frame with pop dots.